The Congress, which is currently in power in Karnataka, can hope to win between 90 and 101 seats. The Bharatiya Janata Party is expected to bag between 78 and 86 seats. Although Karnataka seems to be heading towards a hung,Siddaramaiah-led Congress is expected to emerge as the biggest party in the state. An India Today opinion poll in collaboration with Karvy Insights predict a hung Assembly in Karnataka this year. The opinion poll has been conducted a month before the Southern state goes to poll on May 12. 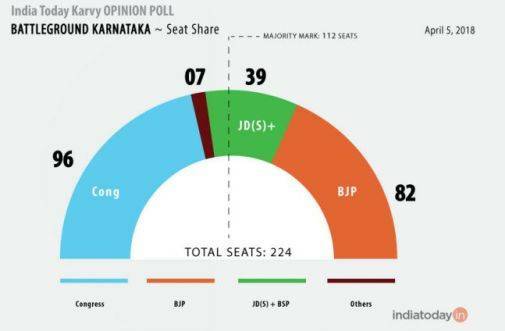 The India Today-Karvy Insights opinion poll ahead of Karnataka state Assembly elections shows that no political party is expected to reach the magic number of 112. A total of 224 constituencies in Karnataka will hold elections, whereas one seat is reserved for a Governor's nominee from the Anglo-Saxon community. The Congress, which is currently in power in Karnataka, can hope to win between 90 and 101 seats in the state election, India Today said in a report. The Bharatiya Janata Party (BJP), hoping to add Karnataka to its list of 'Congress-mukt' states, is likely to win between 78 and 86 seats, the opinion poll shows. According to the India Today-Karvy Insights opinion poll, HD Deve Gowda's Janata Dal (Secular) will play the kingmaker in Karnataka. The party and its pre-poll alliance member the Bahujan Samaj Party are expected to win between 34 and 43 seats. As for vote share, Congress will get 37 percent of votes, the BJP 35 percent, and the JD(S)-BSP combine 19 percent, the opinion poll shows. In comparison to how things stand in the Karnataka Assembly as of now, the Congress will register a decline in its seat-share. On the other hand, while BJP will see its numbers go up in the state, is not likely to be enough to push the ensure party to a decisive win in the Karnataka Assembly election. While this may not bode well for Congress, there is a silver lining in store for the party: most of the sample group covered in the opinion poll want the JD(S)-BSP alliance to to join hands with the Grand Old Party. The India Today-Karvy Insights opinion poll show 39 percent calling for the JD(S) and ally to tie up with the Congress in case of a hung Assembly, whereas only 29 percent want the party to side with BJP. For the India Today-Karvy Insights opinion poll, a total of 27,919 interviews were conducted across all of Karnataka's 224 constituencies that will vote in the upcoming Assembly election. Results will be out on May 15. Out of all the interviews, 62 per cent were conducted in rural areas, the remaining in urban centres. Almost 45 percent of electorate in Karnataka are of the opinion that the Siddaramaiah-led Congress government in Karnataka should be given another chance. Support for giving the party a second chance is particularly high among Muslims (65 percent). Among Hindus 44 percent feel Congress deserves a second chance. According to the caste-wise breakup, 55 percent Kubras and 53 percent Dalits believe Congress should get a second chance. Only 37 percent Lingayats and 36 percent Brahmins believe the same. Unemployment seems to be the biggest issue of concern in Karnataka with 22 percent of respondents saying it is an issue that concerns them the most. Price rise, corruption and lack of access to drinking water are among the other top issues of concern, according to the India Today-Karvy Insights opinion poll. Chief Minister Siddaramaiah has scored fairly well after being in power for five years. 38 percent of people have rated the performance of Siddaramaiah as very good or good while another 31 percent have rated it average. Less than 30 percent feel that Siddaramaiah's performance is not up to the mark. The perception that Siddaramaiah's performance has been very good or good is relatively weaker among the Vokkaligas, Lingayats and Brahmins. 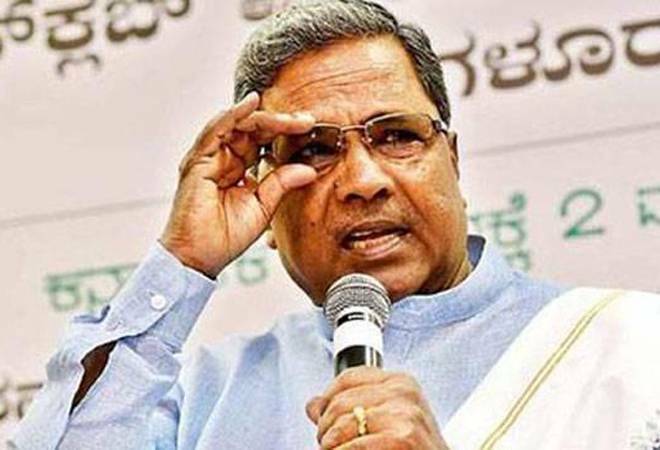 Who will be Karnataka's next chief minister? According to 33 percent of those polled Siddaramaiah is best suited to be the next chief minister, while Yeddyurappa gets the support of 26 percent. HD Kumaraswamy, on the other hand, is the favourite of 21 percent of people. For 46 percent of people in Karantaka, their lives over the last five years of Congress rule have remained the same. On the other hand 30 percent believe that their lives have become better while only 19 percent say that their lives have become worse. Underlining the belief that unemployment is the biggest issue of concern in Karnataka, as many as 56 percent of people believe that there is either a serious lack of jobs in the state or that unemployment has become worse over the last five years. Only 33 pre cent are optimistic about the jobs situation in Karnataka. A significant 40 percent of people believe the Congress is corrupt while nearly half of that find the BJP to be most corrupt. Similarly, nearly 50 percent of people believe that over the last five years of the Congress government, corruption has either significantly or somewhat increased.